"What do you all think of farmers? Saints? Bah! They're foxy beasts!" In 16th-century Japan, a village of simple farmers sees their own doom coming when local bandits target their village for attack. In a desperate attempt, they send a handful of people out into the world to hire samurai warriors—for nothing more than food—in the hope they'll be able to get rid of the bandits. This is the setup for Akira Kurosawa's Seven Samurai, a film that, in many ways, is beyond words. It's a monster of foreign cinema and has set the standard for a number of projects since. It's also regarded as one of Kurosawa's finest works, in a career filled with 'finest works.' Seeing it now, I realize it was years ahead of its time in many ways, both as a compelling human drama and high adventure story. As the villagers attempt to hire the samurai, they find themselves faced with the fact that no warrior with self-respect will work simply for food. That is, until luck smiles on them and they find several brave samurai who are not only hungry, but anxious for battle. They are an interesting collection of people, from an honorable, wise samurai to a brutal, thoughtless, drunkard (as portrayed by legendary actor Toshiro Mifune). Just the process of obtaining these warriors comprises about an hour of the film, and the remaining 2-and-a-half hours are used to tell the story of the village itself and its members. Seven Samurai is long, but so carefully crafted that it's worth it: every minute of time is well spent, on endeavors that either moves the story forward or helps build on its tight, philosophical nature. From the second this film begins, we are completely immersed in the 16th-century. From costume to set design, this 1950s-era production effortlessly transports us back in time. To me, one of the most amazing aspects of this film is its authentic nature. Even with this atmosphere, though, Kurosawa makes everything palatable to a modern audience with his characteristic humor. He knows precisely when to be dead serious and just when to let things loosen up a bit. The action sequences are also quite impressive for the age. They are unflinching, brutal, and masterfully staged. In a sense, I suppose this a different movie for a Westerner than it would be for a native Japanese person, who would be seeing images from his own country's history, coming to life. Kurosawa has painted a very realistic and solid portrait of a time often romanticized and exaggerated in Japanese cinema. This isn't simply action, solely for the sake of excitement; Seven Samurai is a complete epic with no stone left unturned. It's structure has been copied many times over the years, most notably in John Sturges' western, The Magnificent Seven. Even the B-cinema world experienced its own Seven Samurai remake with the Roger Corman produced Battle Beyond The Stars. George Lucas' Star Wars had elements of Seven Samurai and certainly you can see nods to Kurosawa there, including much of the camera technique and characteristic scene wipes. Most people my age grew up on movies like this, but the awe behind Seven Samurai is that you are witnessing the birth of this style. Akira Kurosawa's name is pretty much synonymous with films that required extreme amounts of control and concentration to create, and it certainly shows here. Like an Asian Stanley Kubrick, we can feel his hand on each shot, guiding something, whether it be the camera, the light, the music, or the actors themselves. He can be dispassionate and cold, yet also manufacture emotions. I have always been an enormous fan of Kurosawa's work, but in retrospect, Seven Samurai truly is his greatest legacy. Image Transfer Review: Obviously, Criterion did the best possible with Seven Samurai (especially compared to other, non-Criterion versions), but it's still a very damaged and aged film. It is not unwatchable, but it does have uneven quality depending on the scene. In some places there are no problems; it's a nice, fine-grain, black & white image. In others, there are serious tears, scratches, and other problems, including darker-than-normal footage. So, it's sort of a mixed bag; but it is, however, much better than previous, un-restored versions. Audio Transfer Review: Like the video, the audio suffers from age as well. As a single channel mono mix, it functions well, but can be harsh and somewhat distorted. Most of the film has pops and crackles, but the hiss and hum you might expect seems to have been cleaned out. Even with these problems, it shows improvement from previous incarnations. Extras Review: The most substantial feature is an audio commentary by Japanese film expert Michael Jeck. Rare is it that you see ANY movie of 3 hours in length receive a commentary, let alone 3-and-a-half, and Michael Jeck indeed talks throughout the entire film, almost non-stop, unleashing a vast amount of analysis and information about the film. At times I felt like he was talking down a bit to listeners, but that aside, you will come away from the commentary with a deeper understanding of Kurosawa, the actors, the technique, and even some historical information about Japan. 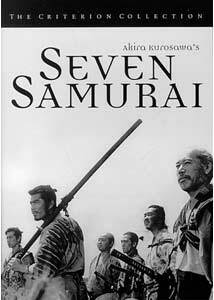 Any fan of Seven Samurai should spend at least some time with this audio track. Also presented is the original trailer, with its hard subtitles for U.S. distribution. The trailer is in virtually the same condition as the main film, so there's really no complaints. The keepcase booklet contains a short review/essay by critic David Ehrenstein. Although the disc is dual-layer, I was unable to detect the layer change, most likely well hidden in one of the many fade-to-blacks. Seven Samurai is a marvellous epic that truly deserves the Criterion treatment. As one of their earilest experiments with the DVD medium, it easily succeeds. It might not be the next, big, 2-disc pack on the market, but the work contained within is, often, many times greater than those films.